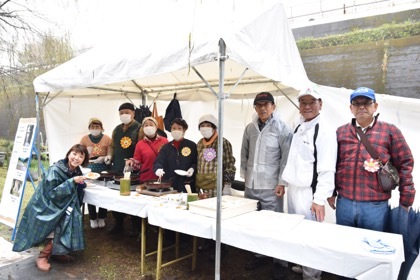 Report on the Kumamoto “Smiley Flowers” charity event : New Day – There will always be a new tomorrow. There will always be a new dawn. A New Day. 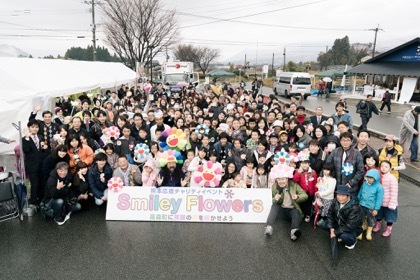 On December 4th, a special charity event “Smiley Flowers” took place in Takamorimachi in Aso-gun of Kumamoto prefecture. 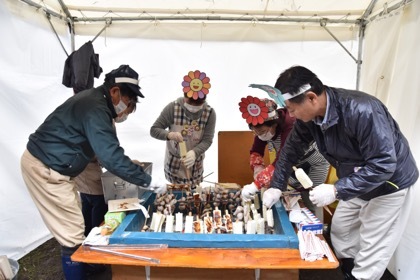 The transportation in the area was seriously damaged by the large earthquake that hit Kumamoto on April 14th, and the recovery efforts continue to date. 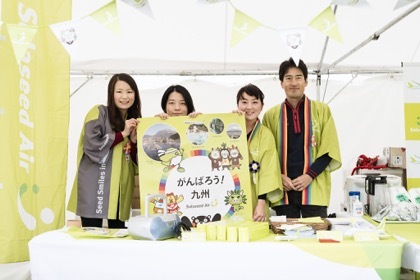 The venue of the event was Takamori Yusui Tunnel Park. Back in 1974, construction for a new tunnel started to connect JNR Takamori Line and Takachiho Line, but in February 1975, a large amount of groundwater suddenly surged, causing the project to be abandoned. 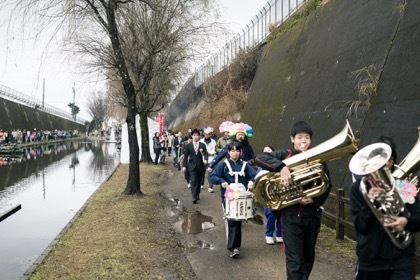 Since then, the spot has supplied water to the residents of Takamorimachi. 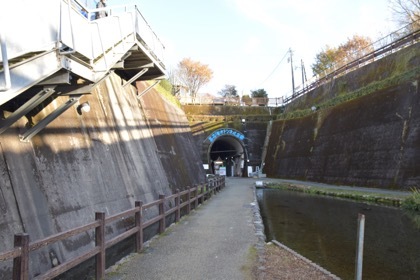 With abundant groundwater flowing through the channel, the tunnel currently serves an oasis for the people in the town and from other places within Kumamoto. 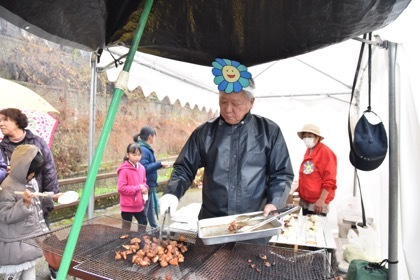 For the event, the café in the park was redecorated into the special Smiley Flowers café. 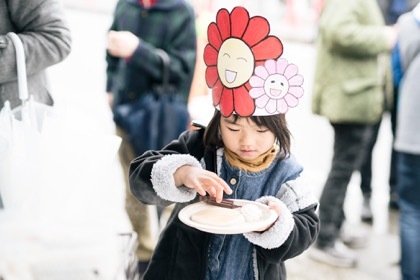 The project was conceived by Takashi Murakami and realized with the support from Koji Muraoka, the president of Kyushu Pancake who led the event team as the organizer, and a cosmetic brand shu uemura. Despite the rain, we saw as much as 1,500 visitors from within and outside of the town. 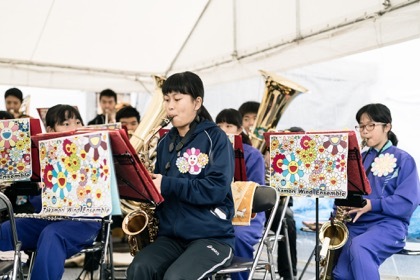 The opening ceremony kicked off with a brass band music performed by the local junior high school students. 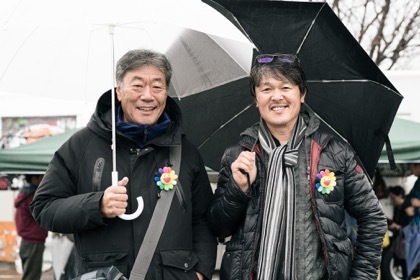 Every local resident wore a handcrafted ornament featuring Murakami’s iconic Flowers characters. 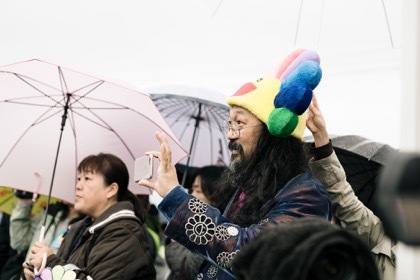 Murakami was moved by the high-spirited performance. After the ceremony, we marched to the entrance of the tunnel together with the band and the visitors. 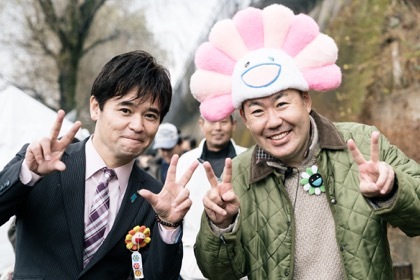 Daisei Kusamura, the mayor of Takamorimachi (left), and Koji Muraoka, the president of Kyushu Pancake (right). 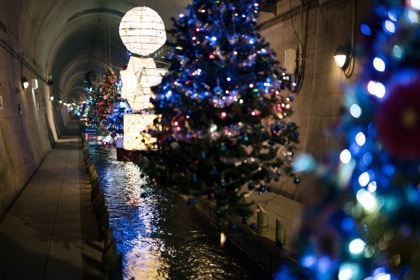 After arriving at the tunnel, we held the lighting ceremony of the Christmas trees decorated by the town residents. Three, two, one! 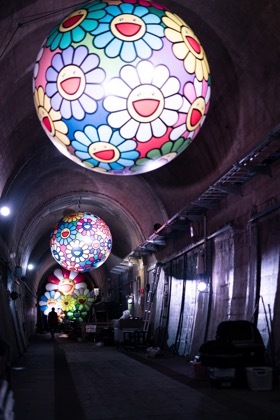 Along with the trees, there were some special artworks adorning the interior of the tunnel—the original balloons titled “Flowers” produced by Takashi Murakami specifically for the event. Inside the park, a number of fun events took place. 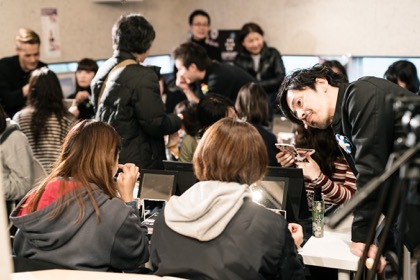 One of the most popular attractions was the makeup lesson organized by shu uemura. 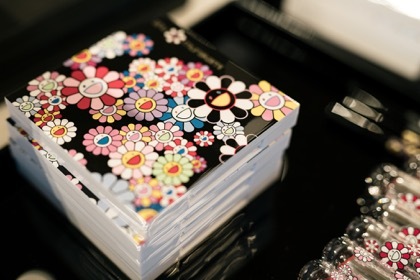 A team of artists led by the brand’s artistic director Kakuyasu Uchiide advised the best matching makeup for each participant using shu x murakami 2016 holiday collection. 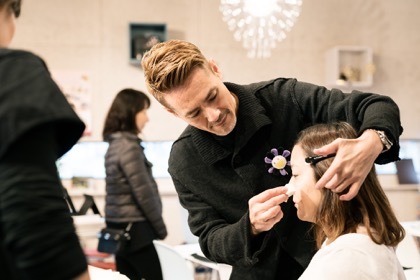 The International PR Manager Harumi Muraoka and the staff at shu uemura all worked together to help make the event more exciting. 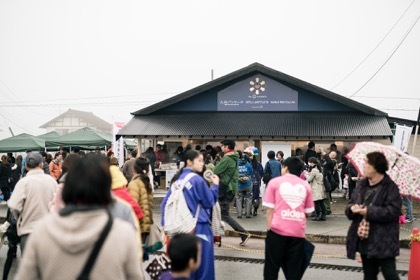 A long line formed in front of the Kyushu Pancake’s baking class for parents and children. As the parents took care of the baking part, the children enjoyed the decorating part. Products of Kyushu Pancake are made with materials supplied from within Kyushu such as black rice grown in Kumamoto. 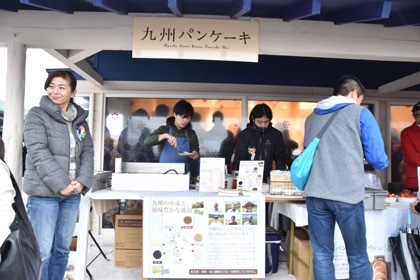 The event program included the hospitality services by the local organizations as well as the complimentary treats from the supporting companies such as Solaseed Air. People smacked their lips as they enjoyed the tasty local foods that warmed up both their bodies and minds. 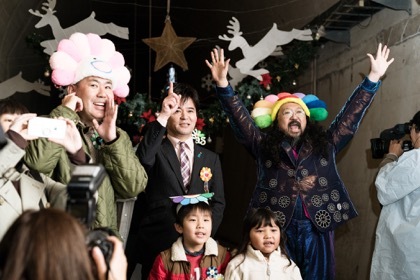 On December 4th, Takamorimachi was filled with smiles and flowers. We would like to express our heartfelt thanks to all the participants and supporters. 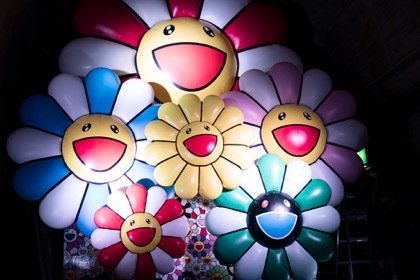 “Flowers” balloons by Murakami will be on display until December 25 along with the Christmas illuminations. We hope to see you there!